I made these Christmas cards for Christmas Cards All Year 'Round February challenge. Again, I waited too long for this month's challenge however, here I am, I made it! This month's challenge is to create a CHRISTMAS CARD with at least 3 hearts on it! 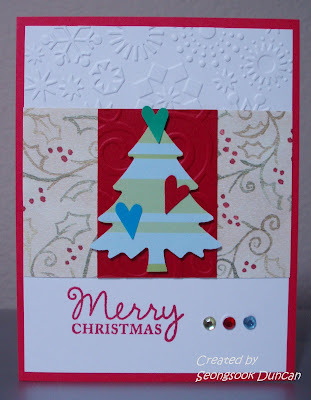 I used the OWH Stars & Stamps Sketch #5. 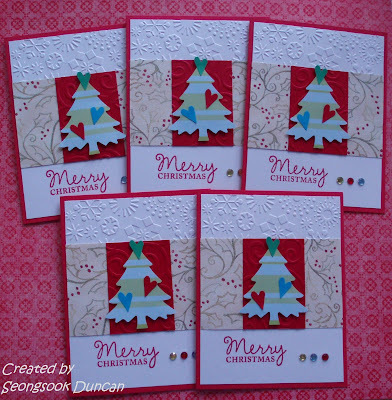 Very cute cards, I don't know if I've ever made a Christmas card with hearts. This is a great way to do it! And it works perfectly with the sketch too! These are awesome! Love your layout! I just can't imagine making Christmas cards yet! LOL! LOVE these cards and you did a fantastic job with this weeks sketch! These are beautiful cards! I just love the hearts on the tree, what a great decoration. Thanks for playing along with the sketch! The cards are simply adorable! Loved the texture and the 3D-feeling! I wish I'd seen the orignal blog last year, when I was trying to put together my Xmas cards! Gorgeous card!!! Thanks for participating in the CCAYR challenge!!! Beautiful, I love the embossed background! Thanks for joining us at CCAYR!